.hack//G.U. Vol.1//Rebirth (.hack//G.U. 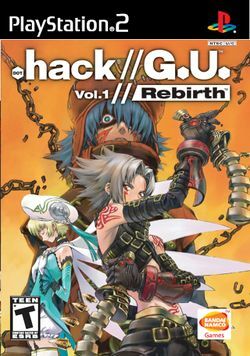 Vol.1 再誕, .hack//G.U. Vol.1//Rebirth?) is the first of the three part .hack//G.U. series that launches .hack Conglomerate. Vol.1 Rebirth, was released in Japan on May 18, 2006 and on October 24, 2006 in North America. The game takes place after the .hack//Roots anime series, which serves as its prologue. Due to a fire at the CC Corporation building, the MMORPG "The World" had to be shut down. CC Corp. salvaged some of the data and merged it with another project, creating a new version of the game called "The World R:2", which is where the .hack//G.U. series takes place. Many players of the original The World quit the game after learning that their old character data had been destroyed. Major guilds became a large part of the game and most players took sides; this led to the game being overrun with Player Killers. Vol.1 Rebirth follows Haseo, an Adept Rogue.